It’s where you keep your muscle car or maybe it’s a workshop where you spend most of your time working, either way, your pole barn is a space that you need to generally keep comfortable. 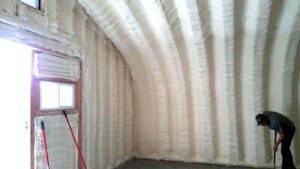 With nearly 15 years experience, RetroFoam of Michigan knows insulating your pole barn with spray foam will keep the structure weather conditioned and will help regulate the temperatures inside. Whether you use your pole barn for storage, a workshop, or you run a business out of it, you need that space to be a comfortable place to work. Pole barns come in various shapes and sizes meaning the price range is very wide. Pole barns run the gambit on size. Some pole barns could be a 10 feet by 20 feet structure that acts as a second garage, while others could be a 50 feet by 200 feet workshop or warehouse a person is running a business out of. The projected cost to insulate a pole barn varies between $8,000 and $20,000 depending on the size of the structure and the area that needs to be insulated. What Factors Determine the Cost to Insulate a Pole Barn? The biggest factors in determining the cost of insulating a pole barn is the size of the area to be insulated and the material used. Typically contractors use spray foam to insulate a pole barn, but the decision must be made on whether to use open cell or closed cell spray insulation. There are several differences between open cell and closed cell spray insulation including the composition, blowing agent, sound dampening capabilities, and moisture permeability. Spray foam insulation, regardless of the type, is going to create an air seal and insulate your pole barn. On the walls of the pole barn, deciding what kind of spray foam to use is best determined by whether the area will be exposed or not. If the owner doesn’t plan to cover the foam with drywall, then a good contractor would recommend the closed cell foam. This is because it is a much more durable material, so if it is run into with a forklift or hit with tools, it’s not going to get damaged. Open cell foam tends to be much more pliable and very soft, meaning it would have to be covered on the walls to avoid damage. On the ceiling of the pole barn a contractor usually recommends open cell because it can be applied thicker and easier at a lower cost to the customer. The open cell gives a really solid insulation on the lid of the building. Why Insulate a Pole Barn? Most people insulate their pole barns to be more comfortable, but also to regulate temperature and to cut down on noise. If the pole barn is used for storage for a hot rod or a boat, because those are very expensive items, a person would want to make the space weather conditioned and also have the ability to regulate the temperature. Insulation helps to keep the temperature in the pole barn regulated and allows for the control of humidity levels. When the pole barn is used as a workshop where you do wood working, metallurgy, or any kind of craftsmanship, you will want the space to be comfortable. The ability to regulate the temperature so that it is physically comfortable while you work is a must. Finally, sound buffering is another factor, especially if the pole barn is near the house. Some customers use their pole barns as a shop and they are using big, loud machining tools. Insulating the pole barn can cut down on the amount of noise heard when you’re up late working with the grinder. Open cell spray foam has great sound deadening qualities so you can work through the night without waking up your household and neighbors. What are the Benefits of Pole Barn Insulation? The biggest benefit of having a pole barn insulated is it will be more comfortable to be inside the structure. The pole barn will also be much less costly to heat and will help to weather condition the items stored inside. What Needs to be Done Before the Pole Barn can be Insulated? The only preparation that needs to take place is to move furniture, materials, equipment or anything being stored in the pole barn must be moved. A good contractor will ask that everything be moved at least three feet from the walls or to the center of the room. On the day of the job crews will come and make sure everything has been moved away from the walls. Next they will get right to work taping plastic over any windows and doors. The fun begins when crews suit up and begin spraying foam on the walls and ceiling. In most cases it is possible to also insulate the overhead door of the pole barn using the closed cell foam. The closed cell foam is used on the door because it does not expand very much. Crews will then cut some of the angles off to make sure the door will open and close. How Long Does it Take to Insulate a Pole Barn? 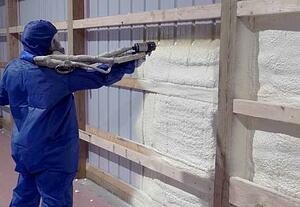 The length of time it takes to insulate a pole barn with spray foam depends on the size of the structure. A very large structure could take two days or it could take two crews to do it in one day. A good contractor’s goal will be to finish every project in one day when possible. Can Just the Ceiling or Just the Walls of the Pole Barn be Insulated? An experienced contractor will always suggest the entire pole barn be insulated. That’s because pole barns have very thin walls and if they are metal, that metal is a conductor for heat and cold. So when it is cold outside, it will radiate that coldness inside and when it’s hot outside, it will radiate the heat. Without insulation the building is going to get either very hot or very cold. Insulating the entire pole barn will create an air seal to keep the outside air from leaking in. When you are ready to schedule a free estimate give us a call at 866-900-3626, or fill out the form on our website. You can also check out our foam insulation budget calculator to give you a rough idea of the cost to insulate your pole barn with spray foam.